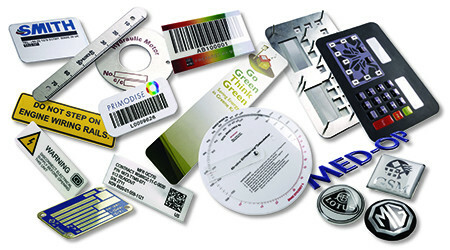 GSM manufactures a complete range of plastic and metal labels & nameplates offering a complete one stop service. We can screen print, digitally print, anodise or etch offering different processes suitable for different quantity requirements. Enhance your products with a high quality 3D logo badge. GSM's anodised labels, domed badges, embossed aluminium and die-cast badges offer a choice of finishes to ensure that the badge reflects the quality of the product. GSM offers a range of serial number and rating plates using vinyl, Polycarbonate, aluminium, stainless steel and brass. The nameplates can be supplied sequentially numbered, barcoded and marked with your unique information as required. Our rugged barcode labels are suitable for even the harshest of environments and have been UV stability tested to a minimum of 5 years as well as salt mist testing. GSM can reproduce linear barcodes, 2D Datamatrix codes & QR codes. We can produce under surface printed graphic overlays to meet your specification. Graphic overlays can include led & led display windows, embossed buttons and selectively textured finishes as well as full-colour graphics and a self-adhesive backing. GSM produces bespoke control panels with full colour printing and cut-outs as per your requirements. We offer control panels in anodised aluminium, screen printed acrylic or polycarbonate assembled onto an aluminium backing panel. Whether you need warning labels for products, warning signs for production areas or for outside the building, GSM has the perfect solution. We manufacture warning labels in rolls, on aluminium and printed on vinyl or rigid PVC. As an approved MOD protractor manufacturer GSM can produce acrylic scales and gauges used for map-reading, calculators and promotional products. These can be digitally printed and laser cut as per the required specification. GSM Graphic Arts - The Label, Nameplate & Fascia Specialist. Founded in 1974 and based in Thirsk, North Yorkshire, GSM Graphic Arts is the UK leader in the manufacture of Labels, Nameplates & Fascia panels. Using the latest technology GSM Graphic Arts can offer a labelling solution for your product branding badge, graphic overlay or serial rating plate requirements. Either printing the labels using our digital printer or screen printing both using the latest UV ink technology to ensure that they are of the highest quality and will stand the test of time. Our innovative team work with our customers to provide a vast and diverse range of products that can be used in many industries including; Oil & Gas, Marine & Offshore, Aerospace and Medical. Our capability to digitally print both metal and plastic ensures that we can offer a one-stop solution for all of your labelling products. Durable and long lasting labels that are manufactured at our site in Yorkshire include; anodised aluminium labels, etched and filled stainless steel nameplates and under-surface printed graphic overlays. GSM Graphic Arts are proud to have been manufacturing Labels, Nameplates & Fascias in Yorkshire for 45 years.